Taxis are back on strike in Madrid in their latest attempt to pressurise the government to reduce the number of VTCs in circulation andspecifically against the online portals of Uber and Cabify who have captured a significant segment of the market. The strike began at 0600 on Monday 21st January and is set to be indefinite. Some 85 % of taxi drivers in the Madrid region are expected to take part. The strike coincides with the start of the capitals key tourism fair – FITUR – which is due to start on Wednesday 23rd. However a spokesman for the strikers Guillermo Marquina of Elite Taxi Madrid – one of Spain´s main taxi federations claimed it was their members who were the victims, “ We’re already half dead” he claimed befor adding that ‘We don’t want to hurt our clients but we don’t have any other choice”. Apart from maintaining picket lines and blocking streets and access to and from key points such as Barajas Airport and the FITUR venue of IFEMA there will also be a demonstration in Puerta del Sol. 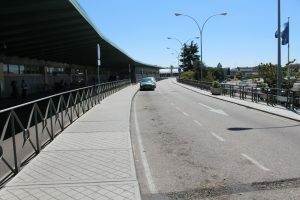 The previous strike that hit Madrid in the summer lasted for 10 days and caused considerable disruption as well as lost earnings by Madrid´s 20,500 registered taxis drivers. The then strike was called off after the apparent climbdown for the Spanish government allowing regional authorities to regulate the taxi sector instead of the central government. The latest round of strike action is designed top ut further pressure on the Madrid government to reduce the number of VTC´s in the region and effectively reduce the number of Cabify and Uber vehicles in circulation.